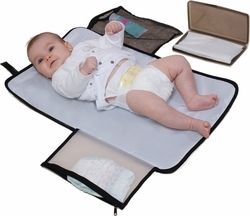 Jolly Jumper Change Eze is the perfect travel change kit for on the go. It includes 2 zippered pockets for necessities and a wipes case. Change Eze fits easily in most diaper bags and Carry handle also attaches to stroller.